The Coronet chases down cars on track. Staging before the parade to downtown Camden before the race. The best part of the weekend was being able to share it with the most supportive friends and family on the planet. Having everyone come out to watch, drop off donuts, lend a hand when the car broke, or just cheer us on really made the weekend fun. I know everyone on the team appreciated all the support. Tucking the Coronet in Friday night before the race weekend. The Coronet ended up 22nd out of 67 for a top third finish. We ran all day Saturday with a clogged fuel filter and failing fuel pump, so conservatively we lost about ten seconds per lap all day. To add to that, our clutch disc failed Sunday afternoon with 90 minutes left in the race, dropping us down 9 spots from 13th overall. We're still very proud of our team effort with 4 out of 5 drivers complete novices to wheel to wheel racing in a 45 year old family sedan. 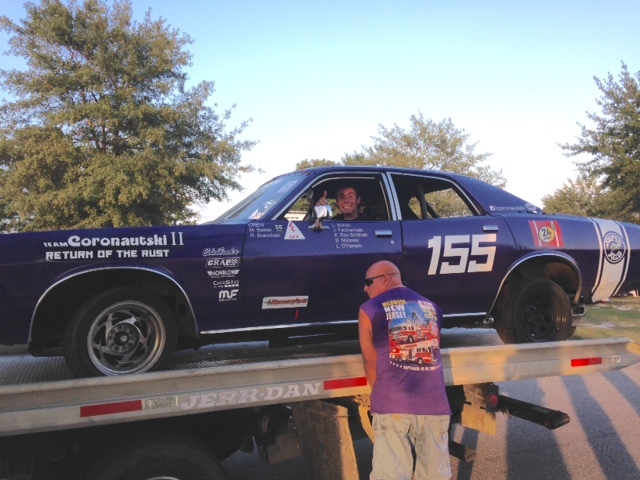 Team Coronautski is determined to make it out to the Lemons race at Barber Motorsports Park in Alabama in February. We've already got a long list of improvements and a new clutch to order. Our goal is a B-Class win and top 10 overall. After that, we'll keep looking for other excuses to bring the Coronet out and have more fun and competition to see how far we can take it. Our race in a nutshell: Even after running off course and breaking the suspension, Luke returns all smiles. Even a broken racecar is fun.